Like an enormous roasted marshmallow with a thick crispy caramelized-sugar exterior surrounding a light and creamy meringue, pavlovas have the same lumpy and carefree charm of appearance, sweetness and ease … or a charm that is actually improved by a jaunty slathering of whipped cream and a reckless scattering of fruit on top. One of the most ridiculously simple desserts you can possibly make, the entrance of a fresh pavlova at any holiday gathering will make a disproportionately cheerful and enchanting impression upon your guests. And if after one slice you're tempted to swear off sugar for the rest of your life, be comforted that you're probably lying in the first place and, in the second place, that leftover pavlova will keep refrigerated in an airtight container for almost two weeks. Any fruit or even gummy candy topping will always look and taste delightful on a thick bed of whipped cream floating above a baked meringue, but Nigella Lawson's suggestion of juicy bright red pomegranate seeds seemed an especially seasonal choice for color — and one in which I was so pleased that this Christmas pavlova is my entry to Holler's No Croutons Required "Taste of Christmas" roundup this month. This recipe is transcribed for those of us who don't otherwise bake in British idioms or metric measures from Lawson's wonderful How to Be a Domestic Goddess collection. 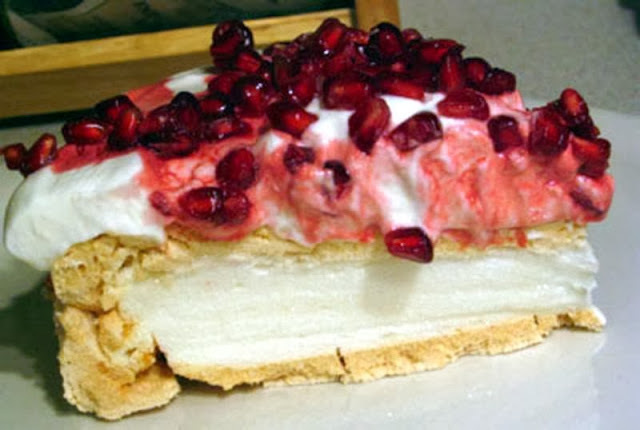 Sweet and fluffy like an enormous marshmallow meringue pillow of snow covered with bright red pomegranate arils, this is a Christmas classic. Preheat the oven to 350°. Line a baking sheet with parchment paper and draw an 8-inch (20 cm) circle on the paper with a kitchen pencil. Beat the egg whites and salt with an electric beater until thick soft peaks form. Beat in the sugar, a scattered spoonful or two at a time, until the meringue is stiff and shiny. Sprinkle over the cornstarch, vinegar and rosewater, and gently fold into the meringue. Pour and scrape the meringue into the middle of the circle — if it is well and thoroughly beaten it should flow no farther than the outer edges of the circle. Using a spatula, roughly flatten the top and smooth the sides. 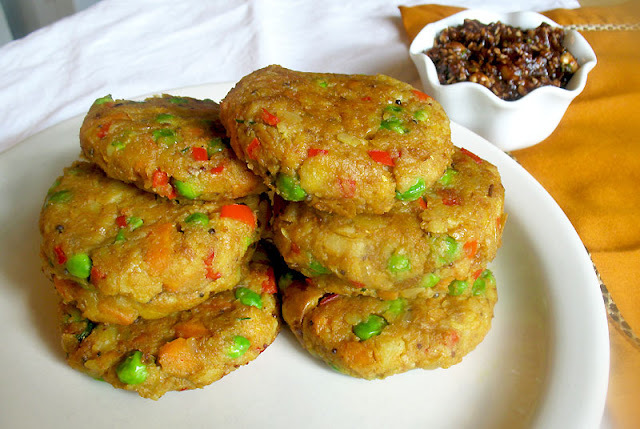 Place in the preheated oven and immediately turn down the temperature to 300°. Bake for 1 3/4 hours, during which time the meringue will puff up. Turn off the heat, open the door and leave to cool sitting in the oven — it should be left to cool in the oven until shortly before serving, or alternately it can be cooked ahead of time and stored in an airtight container for a week or so. When ready to serve, juice and strain half of one of the pomegranates — it's far easier to do this if you have an electric juicer provided you don't juice any of the skin, but pomegranates can also be reamed like lemons with a little bit of muscle. Put the strained juice in a small saucepan with the lemon juice and bring to a light boil. Let bubble for several minutes until the juice thickens slightly. Remove from heat and set aside. Meanwhile, remove the seeds from the remaining pomegranate half and whole. There are several methods for doing this, including scoring the pomegranate into quarters and immersing in a large bowl of cool water, then gently prying away the quarters and seeds. Another method, which while messier is much more satisfying and probably a little faster, is to hold a pomegranate half cut side down over a large bowl and bash it with a wooden spoon. 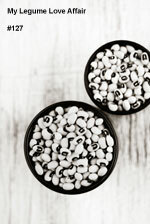 The seeds will start to fall out slowly, but after repeated bashing the poor things are practically begging to get out. Whip the whipping or double cream until thick and airy but not stiff. 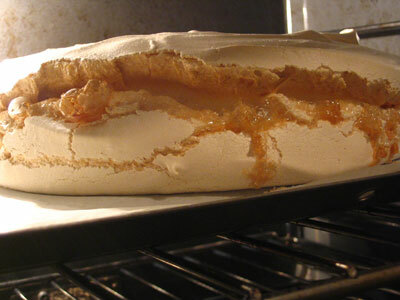 Remove the meringue from the oven and gently invert onto a large flat-bottomed plate, peeling off the parchment paper. Pile on the whipping cream without regard for neatness — part of the charm of a pavlova is its carefree dissassembled appearance. Scatter pomegranate seeds generously over the whipping cream — you may have more than you need, but they are terrific snack by themselves. Finally, drizzle over the pomegranate juice and bring it to the table. Wow, Lisa, this really is gorgeous, and the pomegranate seeds are definitely very festive! And two weeks?? Who knew! Aussies would dispute that claim, mate. The exact location of its first creation and the nationality of its creator has been a source of argument between the two countries for many years, however more serious research into the matter indicates New Zealand as source of today's pavlova. Who are these serious pavlova researchers anyways? Kiwis? Wouldn't that be like Al Gore researching global warming? My commitment is to the truth, which is sweeter than ordinary pavlova. 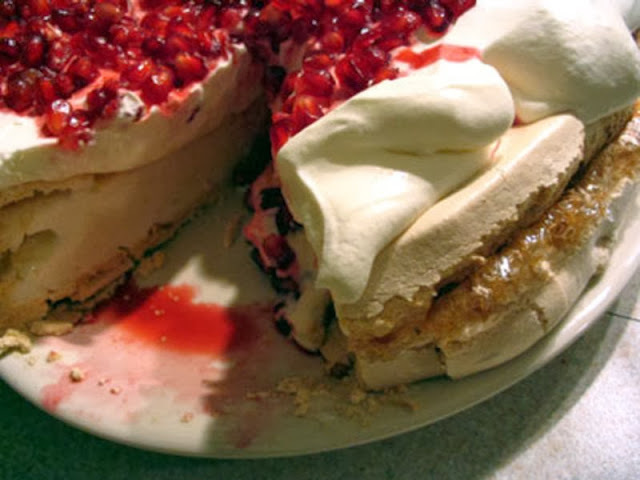 But, unfortunately for truth, Lisa's pavlova is probably sweeter still. So, whoever the experts are, they should just split the difference and give the credit retroactively to Lisa for perfecting the dish. Pavlova is a Canadian dessert. Pavlova has always been a Canadian dessert. I love Pavlova and always correlate it with berries. What a great idea to make it with pommegranate during winter. I love Nigella and this looks great! I made this last year for a group of women and I've been asked to bring this beautiful and easy desert again this year for our Christmas lunch. I have the book but I was asked to bring the recipe. Love it, thanks. Is it also possible to make this with another type of fruit??? 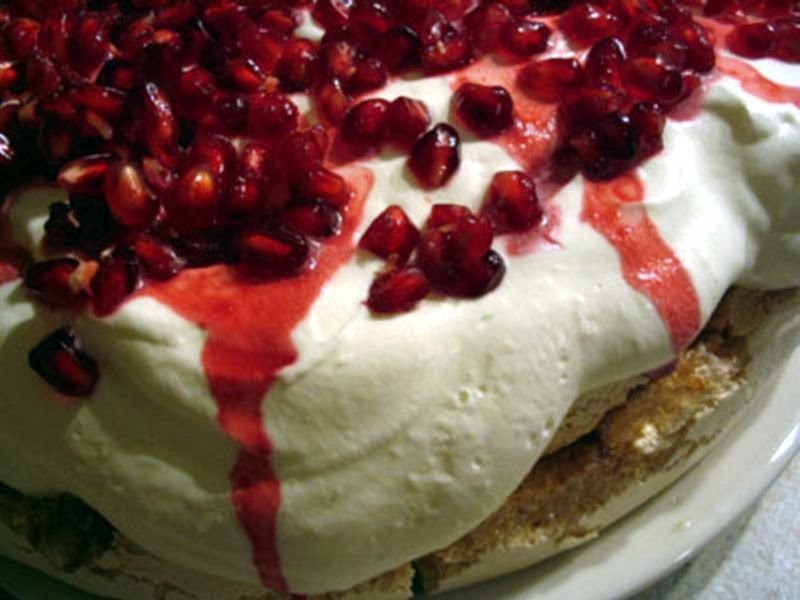 i really wanna make this but my mum is allergic to pomegranate. Sure Jessica. Mix it up. Try it with berries perhaps. It would be just as delicious. Wow!!! awesome this Christmas Pavlova.. This pavlova is our all time best christmas desert. Phew! It’s gorgeous and is making me really hungry. Strawberries or raspberries and kiwi fruit are lovely at Christmas, all red and green. Drizzle with passion fruit if you can find it (a Kiwi friend brings it to me).